The World Wide Web, as we know, is evolving and new services and users are added every day. In a developing country like India, with wireless and mobile connectivity penetrating to the remote pockets, the pace is not slowing down. The Indian government is scheming new projects like National Optical Fiber Network to deepen the connectivity to the rural areas also, as Internet connectivity accelerates the economic growth and benefits all. Complementing that major private Internet companies like Google and Facebook are also keen in widening the Internet reach by novel means like loon and Internet.org, to increase their user base. But providing just Internet connectivity alone is not the end of the problem. As the new user base has a different background from the urban band, we have to bring new content and services for them. This will sustain the momentum and motivate more people to adopt digital activity. The prevailing “one for all” content philosophy may not serve well, in a country like India with diverse demographics. This calls for emerging technologies like Location-based services. 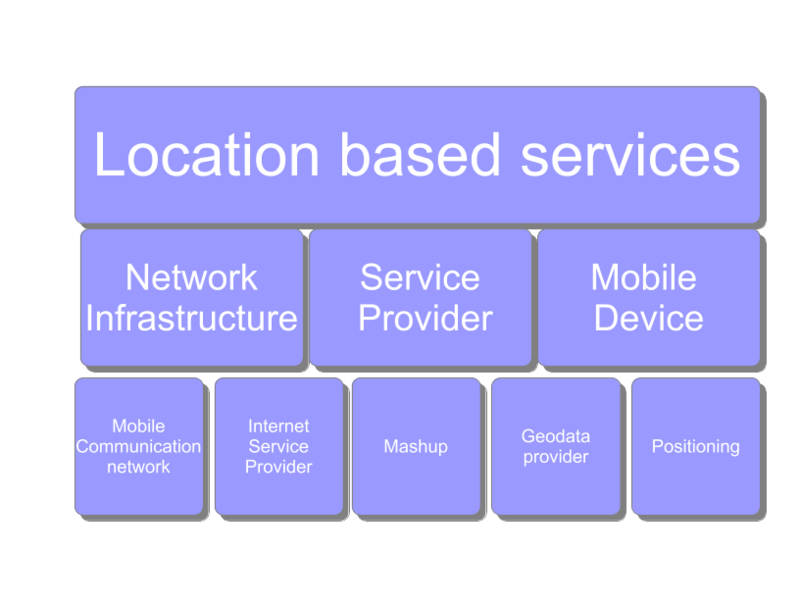 Location based Service can be defined as “A wireless-IP service that uses geographic information to serve a mobile user. 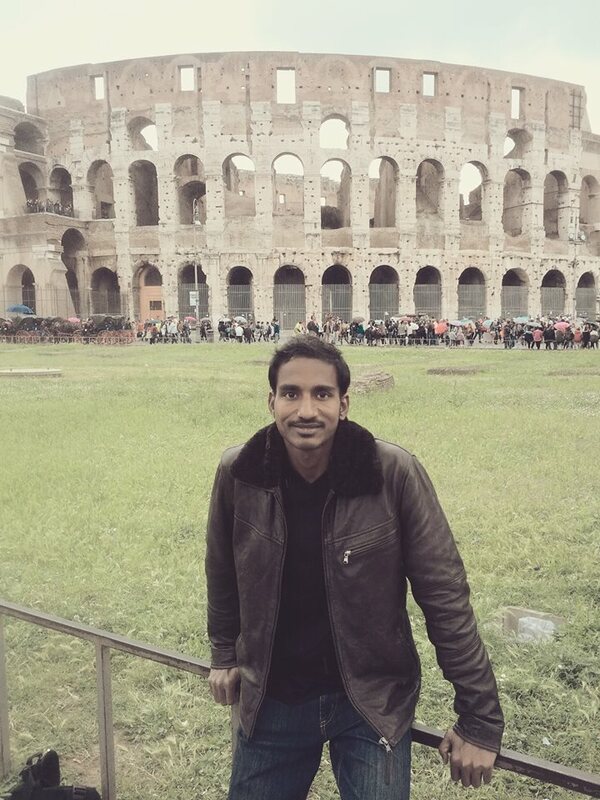 Any application service that exploits the position of a mobile terminal”. 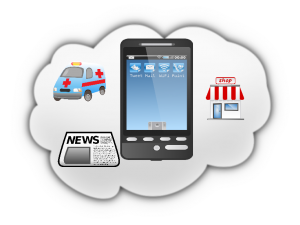 By definition it is an intersection of three technologies: Mobile devices, Internet and Geographic Information Systems. 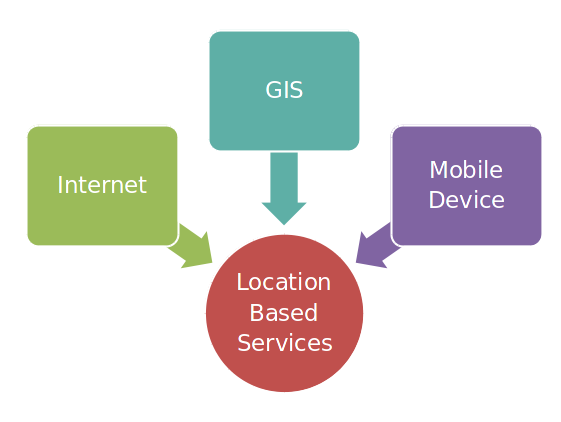 Location based services is composed of different elements like network infrastructure provider, service provider, data provider and mobile devices. The network provider ensures seamless integration and functioning of all services. This includes mobile and Internet service provider. 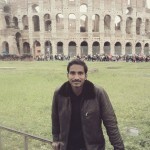 The network provider also helps in positioning in some cases. Mobile devices are used at the consumer end for service consumption. Modern devices come with positioning sensors like GPS, which ensures high precision. In addition to that communication devices like wireless and GSM can assist GPS for positioning. The positioning can be done using different techniques like Signal Strength, triangulation and proximity. The positioning can be done at network level or at terminal or a combination of both. A coarse level positioning can be done based on identifiers like IP address of the device, using lookups. The service providers include content publishers and other localized service providers. In print news media, along with global/national news local news are published to engage users. Similar strategies can be followed on online news. News articles applicable to particular location can be provided on a query-based service, which can be selected at runtime based on the user location. This is just an example, with application to other services like e-commerce, service directories, online classifieds etc. Also the availability of location information might spawn new kind of services, which would not have been possible otherwise. The contemporaneous dominance of the client initiated pull-based services, might yield to more push based services in the future. For example, the push based Google Now project offers serendipitous discovery and contextual recommendations based on the user location, time and other factors. Not all the service providers have to store and maintain all the geographic and location data by themselves. The service provider could be a consumer of other service providers as well. As storing and managing all the data by a single service provider is not be feasible for small players, they can instead rely on other services for fulfilling localized request. Hence they pose as a mash up of different services. For example online classifieds and rental portals like Airbnb.com and Housing.com and many other service providers use Google Maps. 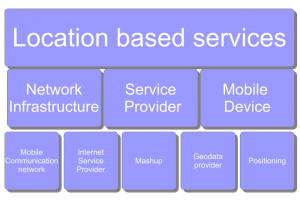 This favors the model of a centralized GIS service provider and a mash up of new generation localized services utilizing the central data service. In another blog post, we will further explore Location based service, such as its utility and issues. Stay tuned! Indeed, internet connection has become a necessity and individuals as well as for economic growth. Everything is taking place on internet these days; be it shopping, payments, movies, Real estate dealings, calls and everything. It is definitely a boon.